Place of birth: Sydney, NSW. Nicknames: "Neuromancer", "Joshie", "Neuro", "Ally". Saber colour: Orange/yellow. Visually looks like flame. Abilities: Josh has a strong Force strength in the basic level powers, putting him slightly above average in most abilities. His special ability allows him to use the Force to rub together air molecules to create friction and ignite them into flame. His power also makes him slightly immune to getting burned. 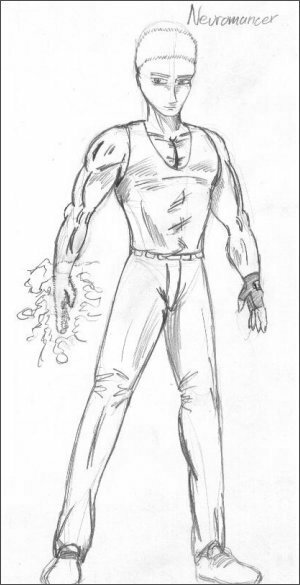 Therefore he uses his powers to create flame around his body as well as projecting it in fireballs. Craig's notes: Josh has been in FanForce longer than any of the others except Kalor. He was in fact one of the first on the team, starting when he was 15. In recent times he has started to wonder how much longer he wants to keep on in the team, and events that happen in Part 3 will lead him to seriously consider leaving to just lead a normal life. Most of the time he is quiet, though he opens up around the people he has known for longer. Josh will play a bigger role in later parts of the series.